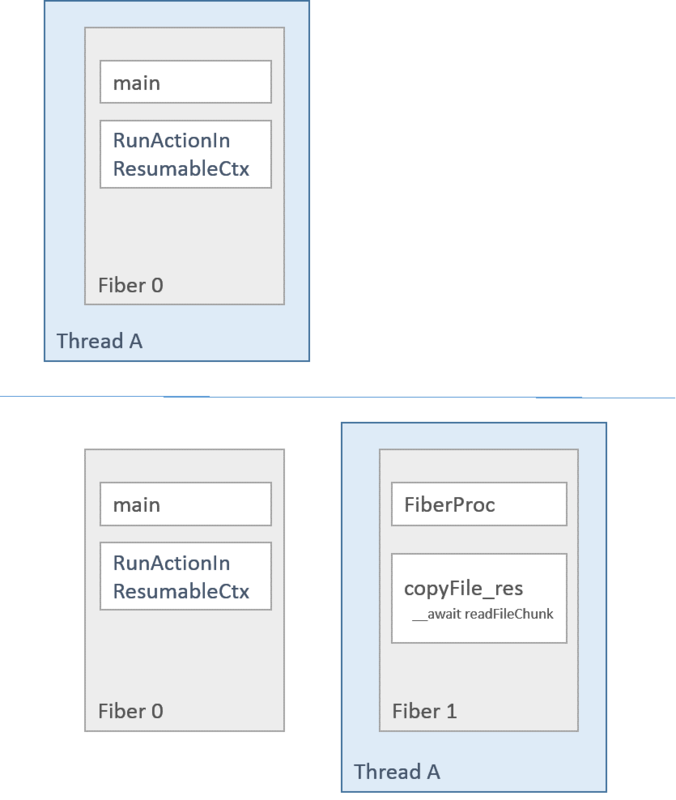 Posted on April 22, 2014 April 28, 2014 by paolosev	This entry was posted in Uncategorized and tagged async, c++, concurrency, fibers, Visual Studio CTP. Bookmark the permalink. For now, I’m happy enough with library solutions for async, just because its still early days and I rather we wait for a solution we are confident it will stick for decades. Many other languages are struggling here, and while the success C# has had with async-await is promising, I wonder if its not a bit early to draw conclusions. I’m sure by 2017 we will have more data and answers, and its good to get the ball rolling. The observation that this language change also covers naturally into first class support for lazy generators is particularly exciting, and is a great sign that its on the right track. I’m a co-author of N3858, and implemented the first incarnations of this inside the MSVC Compiler. I must commend you on your fine job in reverse engineering this – you’re spot on! I’m not sure how much of my original implementation will remain – I’m now at a different company, but curious about it myself. Can’t wait to start using this stuff. Thank you for your comment! Congratulations for implementing this… it was very interesting for me to try to find out how it worked. I am also very curious to see if this will become part of the standard and how it will be changed. And if resumable functions will be also used for generators… I totally agree, I can’t wait to start using it! I still keep thinking that the way to go is to build something on top of what Christopher Kholoff proposed, which has very C++-like features, such as copyability of objects etc, without a hidden runtime somewhere: http://www.open-std.org/jtc1/sc22/wg21/docs/papers/2014/n4244. The solution for async/await is a fancy solution that has hidden overhead, which IMHO violates the zero-overhead principle, whatever others say, and makes functions behave in a way that cannot be copied, since they are not objects. There is no way to make things copyable, among other things, which is *very* convenient, IMHO. It is important for the concept of regularity in modern c++. I don’t mean this solution will not work, I just mean that we can do better, IMHO. Hi. Im not sure this is the right place to ask, but here goes. In the linked talk “Bringing await to C++” by Deon Brewis he mentions an example of a message loop that runs on one thread and intermittently goes away. He fails to run the demo because of a error and goes: “Too bad, it was quite impressive demo”. Do you have any idea of what the code looked like? I’m trying to make a message loop with __await but am new to all this. Any help appreciated. Thanks. Hello! I re-watched Deon’s talk, and what he says that you don’t have to do anything special to have your async tasks running in the UI thread (the thread with the message loop). 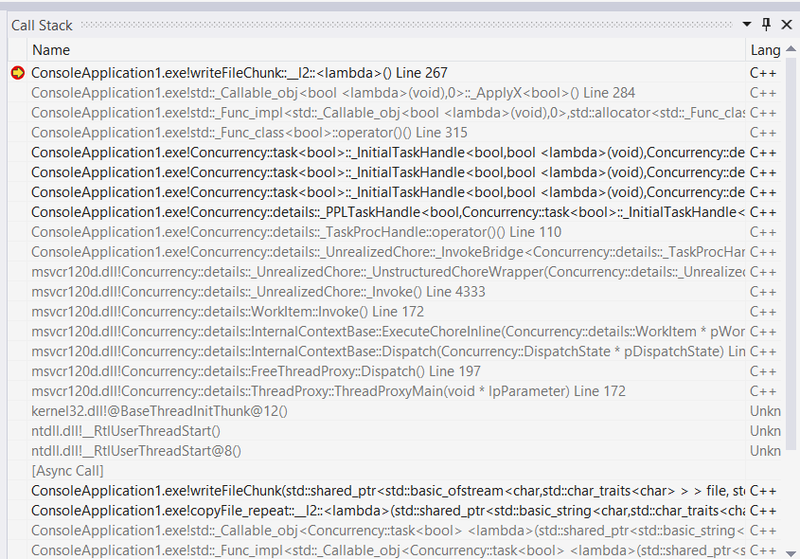 The PPL implementation takes care of running in the UI thread all task continuations that were created in the UI thread. The details are explained here: https://msdn.microsoft.com/en-us/library/hh750082.aspx. This is true even if you don’t use async/await but just the PPL with task.then(). You can try with the sample shown in this StackOverflow question: http://stackoverflow.com/questions/12863583/task-continuation-with-context-use-current-does-not-work.